In autumn 2017, as part of an extended trip to the Antipodes, we made a 2-night stopover in Hong Kong on our way out. I don’t normally “do” cities and was a little apprehensive but happily I enjoyed it. 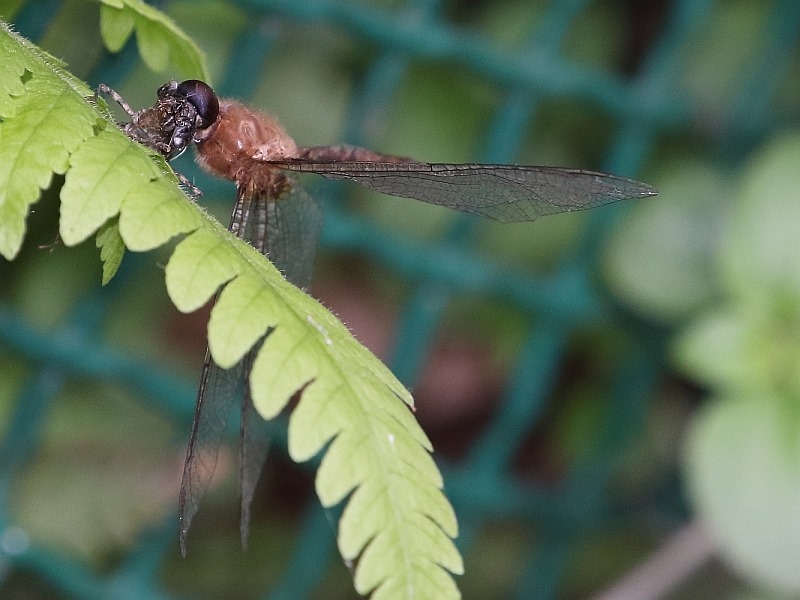 The main reason for my enjoyment was that Hong Kong Park, within walking distance of our hotel, proved to be decent habitat for odonata and gave me five new species, together with a few old friends that I’d seen in Singapore on a previous trip – and this, despite having been warned that October was not a good time for odonata in HK. We made two visits over the first two days. On day two, we braved a little public transport (it’s very good) to visit Kowloon Park on the mainland, too. That proved not to be a good habitat but it did add one to my new species count, so it was not a completely wasted journey. On day three when were due to depart, a tropical typhoon blew through, adding to our overall experience by disrupting life and transport in downtown HK but we did manage to get to the airport to leave at midnight, as scheduled, with a bag of six new species in all. In the afternoon of the day we’d landed in HK, we hopped on the bus to Hong Kong Park from just outside the hotel. Tired from the 12-hour flight and not expecting much, I stupidly took only my lighter weight travel lens (18-300 Sigma). Wrong! 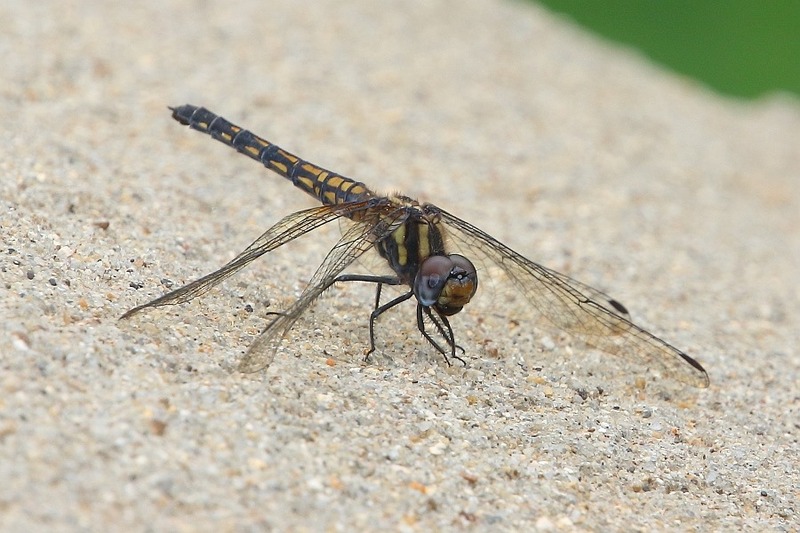 That was the only time I encountered a perched male Saddlebag Glider (Tramea virginia). It’s a distant shot but just about works. Lesson learned. Returning the next day with a more appropriate lens (Canon 100-400), I didn’t get a second chance at a perched male T. virginia, though they were clearly still around because I did get a female on her ovipositing flight. 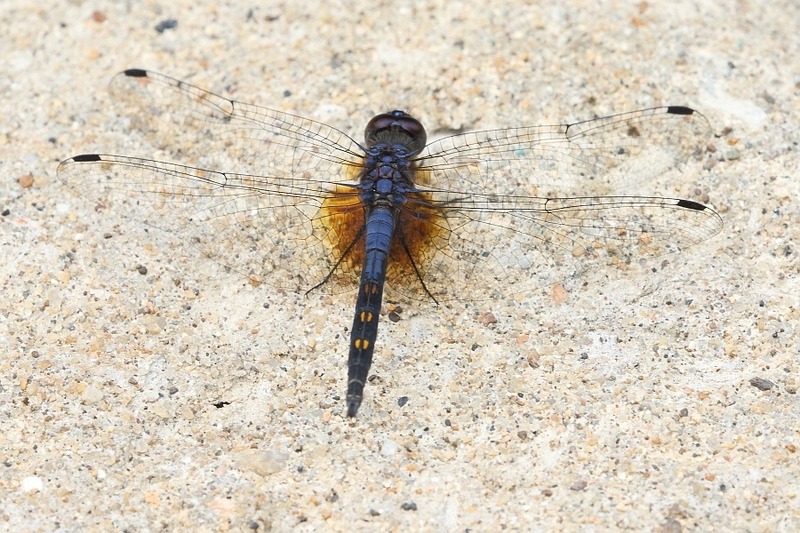 My main delight this time, though, was the wonderful Indigo Dropwing (Trithemis festiva). I was even more delighted to snag a perched female T. festiva, which, I understand, can be tricky to find. Here’s both male and female. This species is in south-eastern Europe and listed in Dijkstra’s book but I haven’t been to the correct areas. 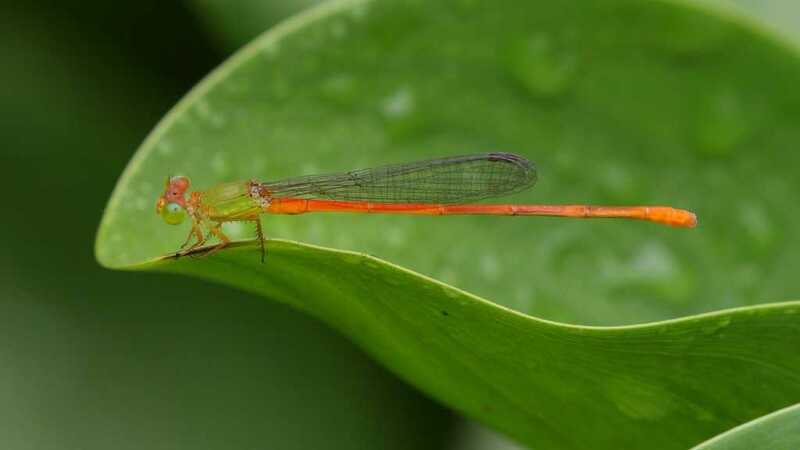 There was also something captivating about the spectacularly coloured Orange-tailed Sprite (Ceriagrion auranticum), which I could hardly stop watching. Here’s the list from Hong Kong Park with my new species in bold. There are four or five water bodies showing on the maps of Kowloon Park so, following the interest at Hong Kong Park, I was expecting more. Unfortunately, most of the water bodies are of the wrong type, manicured/decorative with no vegetation. 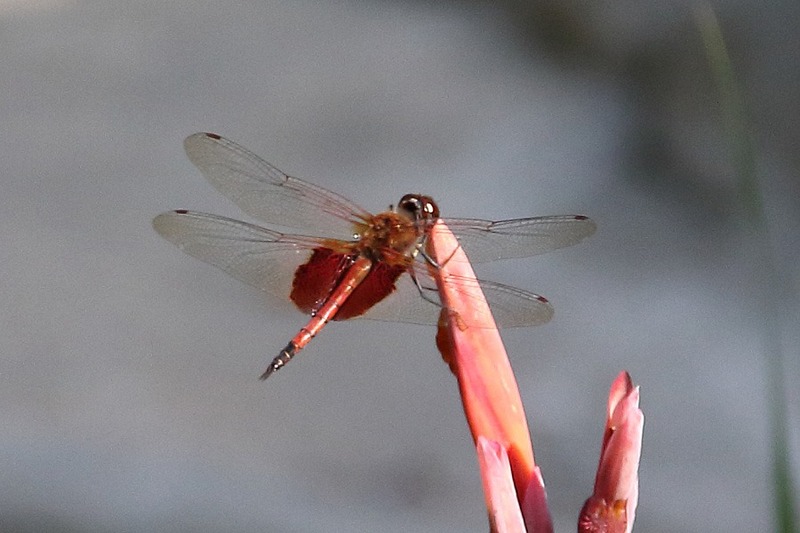 Just one seemed more wildlife oriented and did support odonata but that was it. 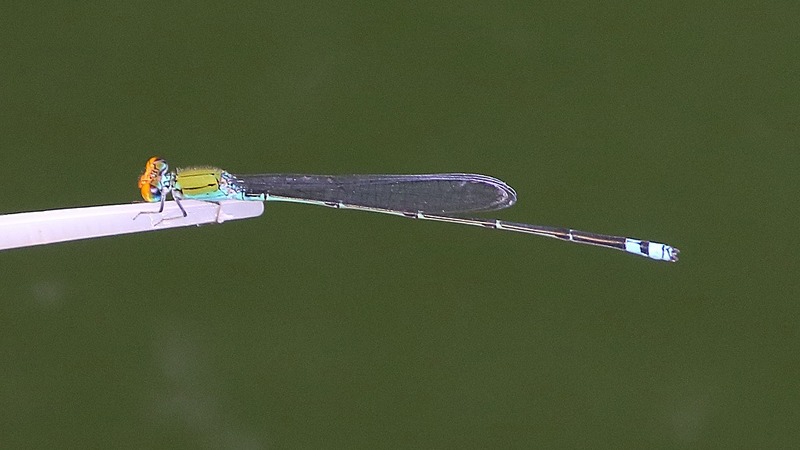 I had to get home to identify my initially unknown new species as the Orange-faced Sprite (Pseudagrion rubriceps). Neither lighting conditions (shaded) nor access (over large, chunky railings) were good but here the little darling is at the only angle I could get. I did see one Anisopteran which has eluded identification. The poor thing had been captured by another unknown insect so getting any better pictures was not going to be possible. Here’s the list, such as it is, minus the unknown dragonfly.